Foster McKeon’s interest in ornamental horticulture and landscape design began as a child when he frequented his grandmother’s garden. It was there that he learned to appreciate the beauty of each flower and nature’s delicate balance. Foster’s childhood love of the garden led to a philosophy of beautiful and creative design, innovative horticulture principles and attention to detail. He had dreams of one day owning his own landscape design business. On his way to achieving that dream, Foster obtained a degree in Ornamental Horticulture from State University of New York in 1984. Soon after, he accepted a position as landscape designer at Casaverde’s in Southport, Connecticut. After honing his craft at Casaverde’s for several years, he then moved on to a senior designer’s position at Oliver Nurseries in Fairfield, Connecticut. In 1995, Foster decided it was time to launch his own design company, aptly named, “Foster’s, inc.,” and make his dream become a reality. Foster’s, inc was launched in 1995. What began as a one-truck two-person operation where Foster created the designs and served as foreman has now grown to two crews with two foremen, a fleet of trucks and a two-acre commercial property in Stratford, Connecticut. 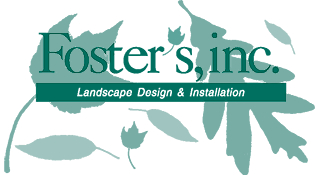 After more than a decade in business, Foster’s, inc. has established a reputation as a quality landscape design company. Foster’s deep-rooted commitment to providing personal service to all his clients remains paramount. Creative design and customer satisfaction have become the hallmark of Foster’s, inc., and our motto “Fine Design is Our Signature” still stands strong today.